An increasing number of applications use implemented camera sensors for tasks such as quality control tasks, measurement technology or identification purposes such as reading code. An also increasing number of industrial applications use multimedia components to improve the user interface or even make augmented reality possible. Powerful processors with integrated camera interfaces simplify the implementation of camera sensors like never before. In order to efficiently implement image processing into an OEM product an individual approach is required. No matter whether the camera is the core of the application or only creates an added value, the entire applications needs to be planned accordingly. Optics, lighting, image resolution and computing power are as well as other requirements like size, power consumption and economic factors are important factors when integrating camera sensors. PHYTEC offers embedded imaging services complement our offering of microprocessor-based solutions and development services. PHYTEC's embedded imaging specialists help implement image processing tasks into customer applications and customized solutions. Our experts develop scalable concepts that can be applied directly to finished products and support you during the entire project development. 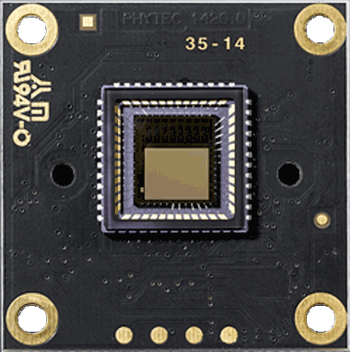 Camera Boards with phyCAM-interface can directly connect to the digital camera interface of PHYTEC SOMs. This allows simplified camera technology integration into compact, custom designed products. The standardized phyCAM interfaces offer a combination of scalable SOMs and suitable image processing components. This provides PHYTEC customers with a complete, customized system. In order to design a functional embedded solution, more requirements need to be taken into account. Besides the image acquisition additional features such as motor control systems, GPS, Audio, CAN or I/O-lines need to be implemented. In addition the hardware needs to be adjusted to mechanical dimensions. PHYTEC meets these requirements due to application-specific PCBs. Individualization is a key component PHYTEC's concept. It is the distinguishing factor in regards to standard, ready-made components. The phyCAM concept has already integrated the application software at the operating system level. The necessary drivers for camera sensor and processor camera interface are integrated into PHYTEC BSPs. When using Embedded Linux, V4L2 Interface is the interface for the application software. The phyCAM-Interface provides the application software image data. The off-shelf image processing libraries then efficiently process the image data. Customers can therefore take advantage of PHYTEC's modular off-shelf hardware and software solutions. OpenCV — PHYTEC camera drivers are compatible with OpenCV, a free program libray with more than 2,500 algorithms for fast image processing. This software is available as a free BSD licence. We provide application examples for our Linux kits. HALCON — The powerful image processing software HALCON allows for efficient development of image processing applications based on PHYTEC SOMs. In partnership with MVTec PHYTEC offers a new way to implement industry-proven algorithms into compact SOMs. phyCAM-P — The parallel interface phyCAM-P is a cost effective way to integrate a camera. Data and control signals are transmitted via a 33-pin FFC cable. This reduces the interface effort to a minimum but offer compatibility with other camera types. phyCAM-P cameras are fully compatible with phyCORE® SOMs. phyCAM-S — The phyCAM-S interface offers even more flexibility. The phyCAM-S cable requires only 8 wires and can have a length of up to 6 m. This way the camera head and the main device can be separate. Phytec offers phyCARD®- und phyFLEX® SOMs that are compatible with phyCAM-S.
phyCAM-G — Backplane phyCAM-G adds powerful LVDS signaling to each phyCAM-P camera module. This allows for long cable lengths with data rates up to 1 GBit. A simple 6-wire twisted pair cable is needed for data transmission (e.g. CAT-7 standard).